Which 2019 Final Four team wins based on cultural superiority? Welcome to one of the strangest Final Fours we’ve seen in a while. 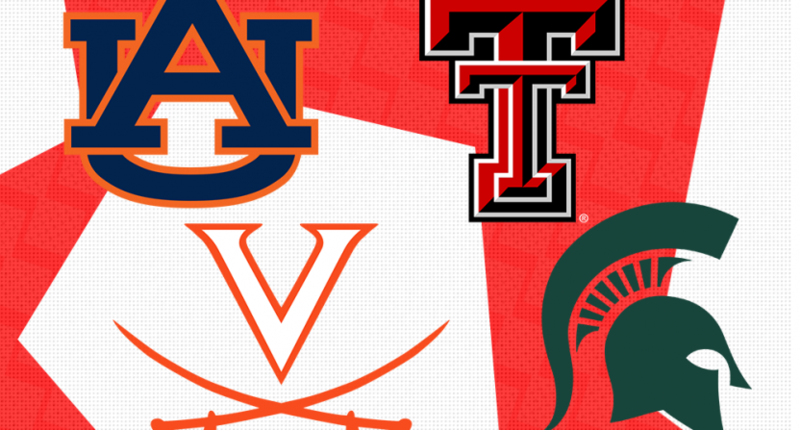 Two major-conference schools are making their debuts in Auburn and Texas Tech. Where are the blue bloods? It’s only the second time in 32 years that the Final Four will not feature at least one team from the following programs: Kansas, North Carolina, Duke, Kentucky, or UCLA. The only basketball-first school is Michigan State. Auburn and Texas Tech fans would gladly trade this Final Four for a spot in next season’s College Football Playoff. And Virginia (No. 25) would gladly trade this Final Four to surpass Duke (No. 8) in the coveted U.S. News & World Report’s Best Colleges Rankings. Who’s going win it all? Who can claim cultural superiority? Here at The Comeback, we’ve done all the homework, so you don’t have to. What he looks like: Chris Beard looks like the recently divorced dad who is visiting Costco for the first time and is absolutely overwhelmed. Reason to celebrate: Get ready to party like never before. Warning: for those of you flying to Minneapolis for the Final Four, don’t make the Guns Up signal in an airport. Greatest athletic achievement: The women’s basketball team won the 1993 national championship thanks to Sheryl Swoopes. The Lady Raiders went 31-3, defeating Ohio State in the national championship game, 84-82. Swoopes set a single-game championship record with 47 points. The lowdown: Lubbock has tumbleweeds and a statue of Buddy Holly, its favorite son. West Texas sometimes looks like and feels like the Wild West. Texas Tech hasn’t been in the national spotlight for basketball since the Bob Knight era (2001-2008). One of Knight’s longtime assistants was Chris Beard. Beard’s journey is an unusual one. In 2015, he was an anonymous Division II coach at Angelo State. He then coached at Arkansas Little Rock for one season, guiding the Trojans to an upset of No.5-seed Purdue in the first round of the 2016 NCAA tournament. Weeks later, Beard was hired to be the coach of UNLV. But when then-coach Tubby Smith surprisingly left Texas Tech for Memphis, Beard abandoned UNLV after just 19 days of employment to go to Lubbock. This serendipitous twist has resulted the greatest basketball season in Texas Tech history. What happened to the guy UNLV hired to replace Beard? Marvin Menzies was fired after three seasons. What he looks like: Tom Izzo looks like the football coach who calls three straight running plays after his team is penalized for holding on first down. Reason to celebrate: Get ready to party like it’s 2015. Seriously, this is old hat for the Spartans who since 1999 haven’t had a Final Four drought longer than four years. That’s remarkable. Greatest athletic achievement: The 1979 national championship basketball team is iconic because of one man: Magic Johnson. In the title game, he faced upstart Indiana State which had another emerging superstar: Larry Bird. This game set the stage for their rivalry in the pros. That rivalry propelled the NBA into the modern era. The lowdown: A lot of the news surrounding Michigan State athletics in recent years has been horrifying. There’s no way to easily transition from that, but we wanted to at least acknowledge what happened. On to significantly less important matters…. Michigan State is one of the largest public institutions in America. Its undergraduate enrollment alone (38,996) is the 10th largest in the nation. Michigan State has a student-run farm and its own dairy complex. The ice cream is spectacular. Izzo is Mr. Final Four. This is his eighth appearance. Among active coaches only Mike Krzyzewski (12) and North Carolina’s Roy Williams (9) have been to more. But unlike Coach K and O’l Roy, Izzo has just one national championship (2000). In fairness to Izzo, he rarely has the sheer volume of McDonald All-Americans those guys get. Pound for pound, Izzo is about as good as it gets. It helps that he’s generally liked by the media. However, his reputation has taken a hit lately due to this and this. If Izzo wins a second title, it wouldn’t be surprising if he retired at the age of 64. He has nothing left to prove. What he looks like: Tony Bennett looks like the guy running a Ponzi scheme who assures you that you’ll get a 35 percent return on your investment. Reason to celebrate: Get ready to party like it’s the 80s again. But hey that totally makes sense since nostalgia for that decade is so hot right now (Stranger Things! GLOW!). Let’s watch Virginia’s 1981 and 1984 Final Four trips on a VCR for old times’ sake. Greatest athletic achievement: Let’s go with the 2006 Virginia men’s lacrosse team that finished 17-0. The Cavaliers set a record for the most successful undefeated season in Division I history, breaking the mark set by Cornell which went 16-0 in 1976. The lowdown: Unfortunately when you play word association with Charlottesville, the first thing many people think about is the horrible events of 2017. But Charlottesville is a lot more than that ugly moment. In 2014, Thomas Jefferson’s hometown was named America’s happiest city by the US National Bureau of Economic Research. The University of Virginia is one of the America’s top academic institutions. Pre-Tony Bennett, Virginia basketball was best known for the Ralph Sampson era. The 7-foot-4 center was one of the biggest college stars of the 80s. He led the Cavaliers to the 1980 NIT title and their first Final Four in 1981. In the Bennett era, Virginia had been known for great regular seasons, followed up by postseason failure. Last season, the top overall seed because the first No.1 seed ever to lose to a No.16. But Bennett earned a lot of good will for the way he has handled that disappointment. And unlike other coaches, Bennett uses a level-headed approach when talking to his players instead of yelling at them. What he looks like: Bruce Pearl looks like the guy you meet in a sauna who is irritated that his son is moving to Miami to become a DJ instead of joining the family plumbing business in Boston. US News & World Report Best Colleges Ranking: No. 115. Greatest athletic achievement: The 2010 national championship football team finally gave Auburn some bragging rights over blood rival Alabama. Heisman Trophy winner Cam Newton led the Tigers to a 14-0 season, topped by a 22–19victory over Oregon in the BCS national championship game. Crazy to think that just two years later coach Gene Chizik would be fired after going 3-9. Southeastern Conference football: It Just Means More. The lowdown: This segment is all about Bruce Pearl because there is a lot to unpack here. No one doubts Pearl’s coaching acumen. He won a Division II national championship at Southern Indiana. He guided Wisconsin-Milwaukee to the Sweet 16. He took Tennessee to the Elite Eight. And now he’s put Auburn to its first Final Four. However, there’s always a however with Pearl. This is a guy who lied to NCAA investigators while at Tennessee. He was fired for multiple transgressions and hit with a show cause penalty. While he was an assistant at Iowa, he secretly taped phone conversation with a recruit and accused an Illinois assistant of offering that high schooler $80,000 and a car. While the NCAA found no evidence of a bribe, that led to an NCAA investigation that resulted in 1991 postseason ban for Illinois. And oh yeah, his former assistant Chuck Person was fired and pled guilty last month for his role in the FBI college basketball scandal. Pearl might be a champion in a week but that will not stop people from looking at him with cynicism and skepticism. Auburn fans won’t care. They’ll just put more toilet paper on trees. Texas Tech vs. Michigan State: This sounds like an Alamo Bowl matchup. It did happen. Texas Tech won in January 2010, but I’m taking Sparty in the basketball rematch. Virginia vs. Auburn: If this were WWE Raw, one coach would be the heel and the other the face. Go with the Cavaliers. Your national champion: Michigan State.